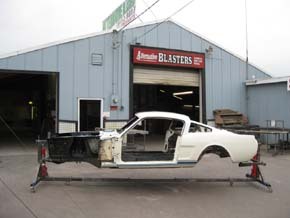 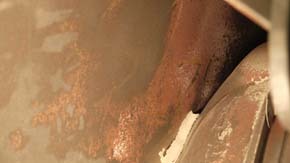 The car was then taken to Alternative Blasters in Marysville, Washington to have its paint removed. 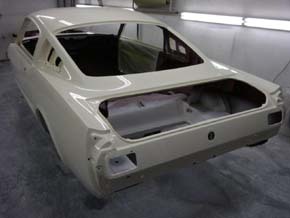 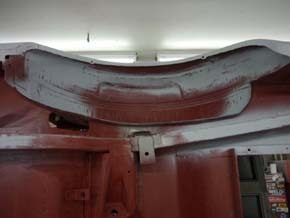 The only place not touched was the top of the rear quarters where they were originally leaded from the factory. 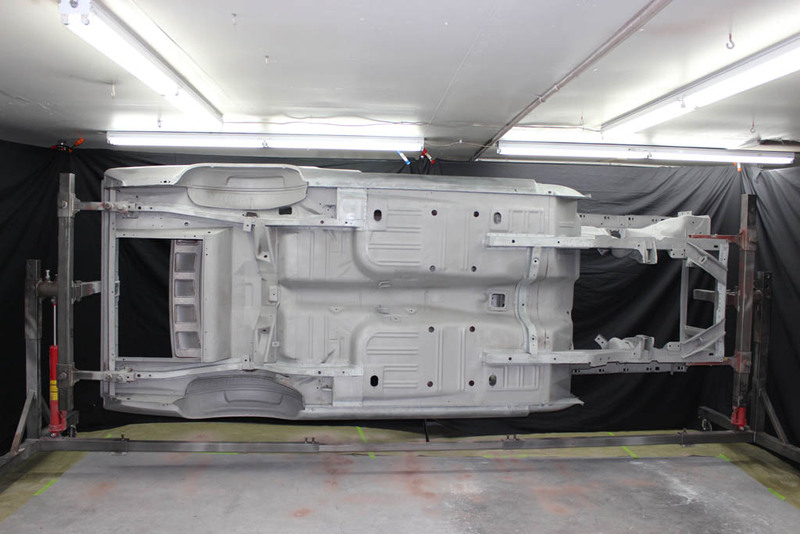 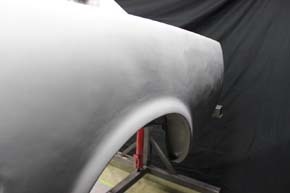 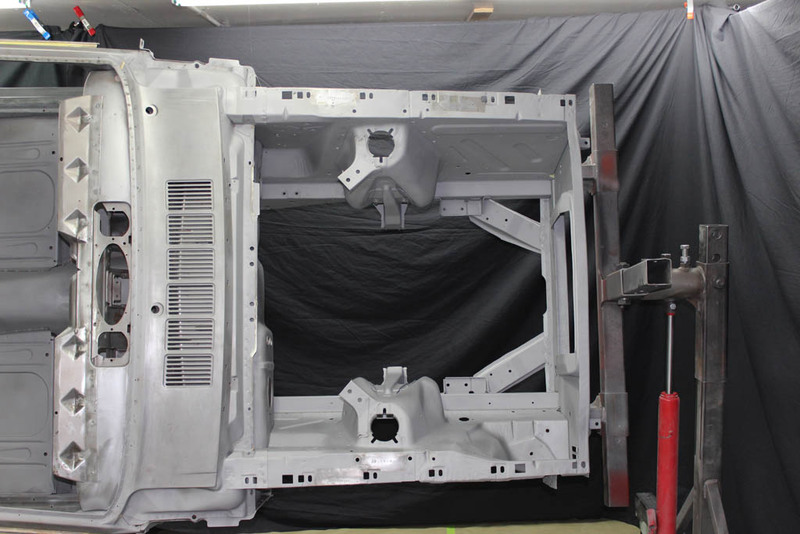 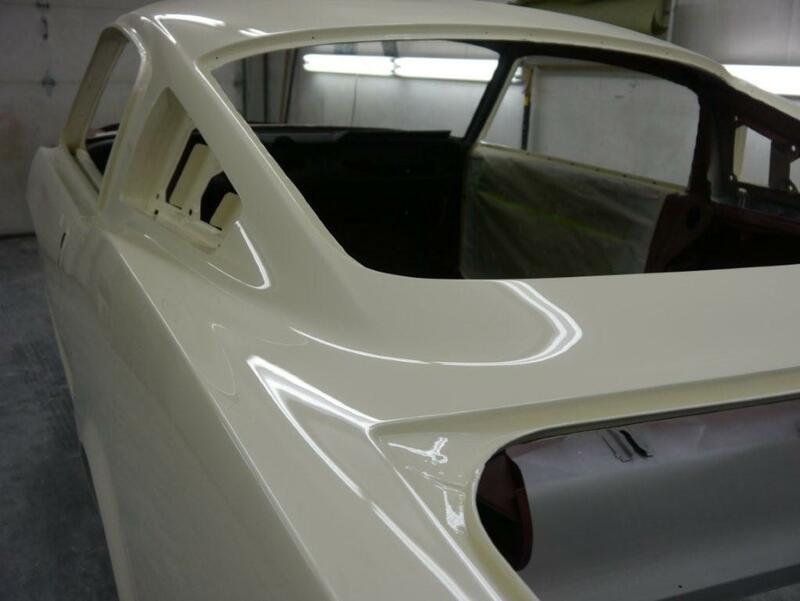 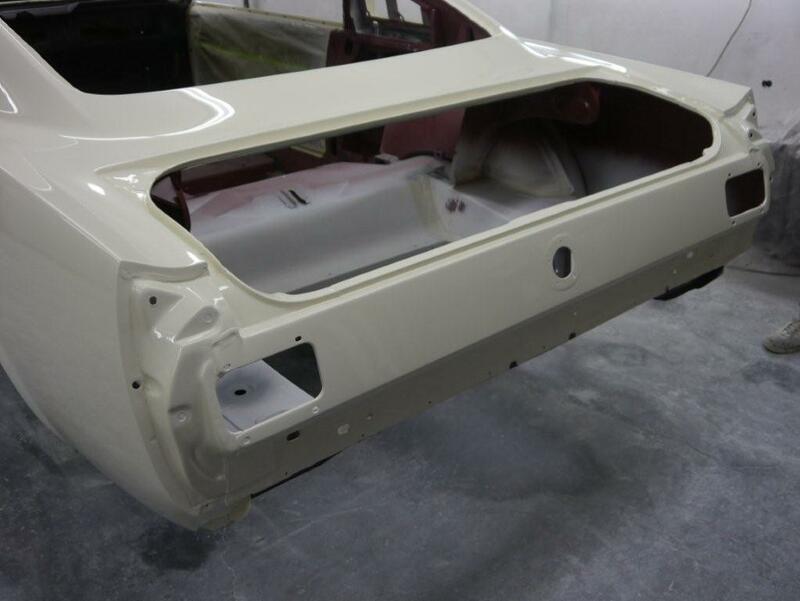 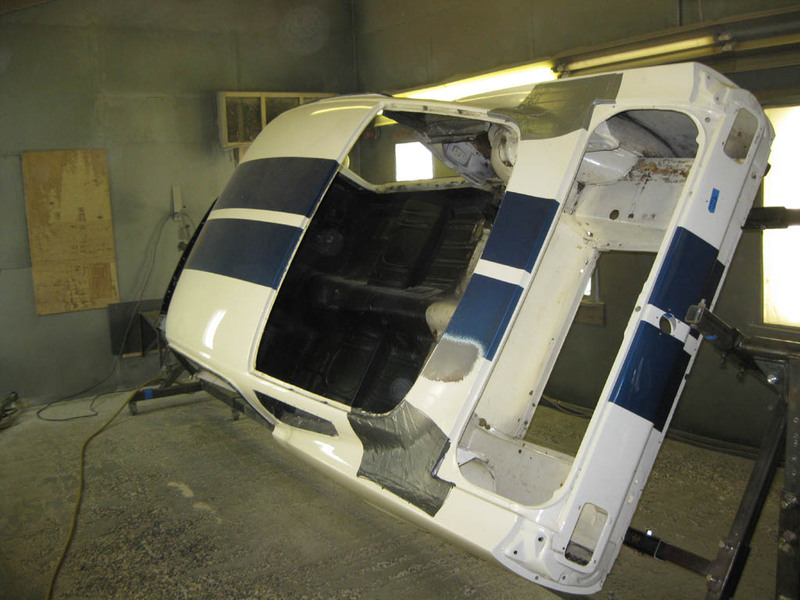 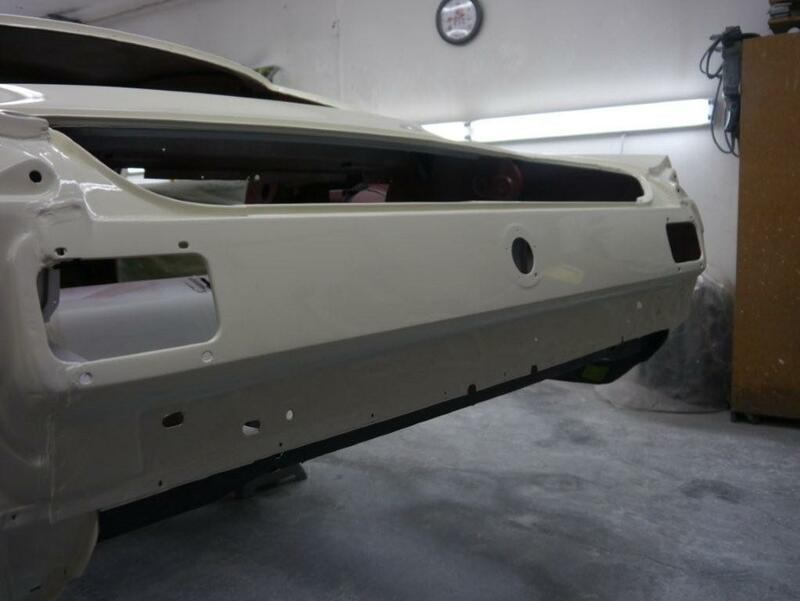 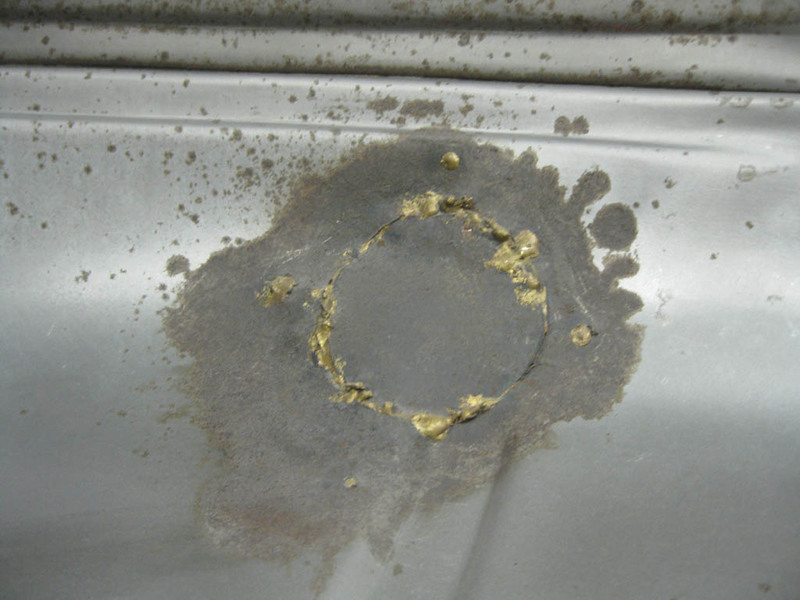 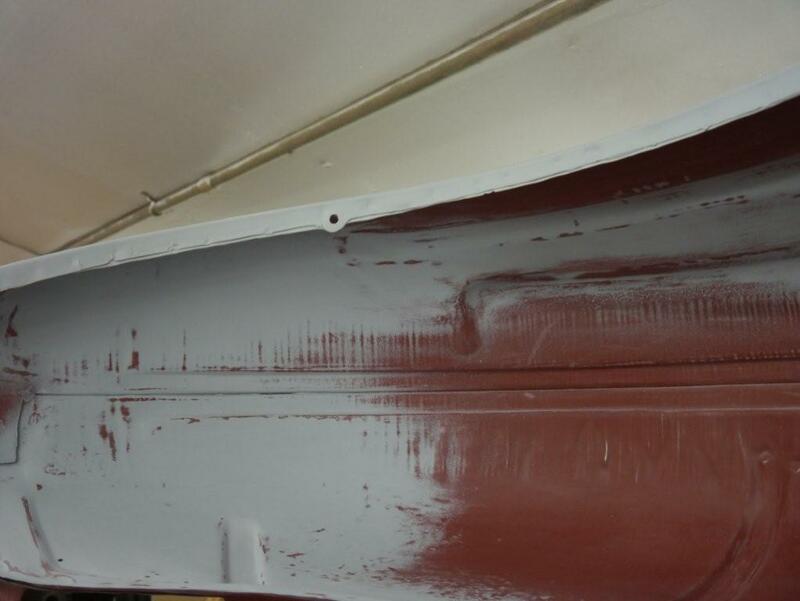 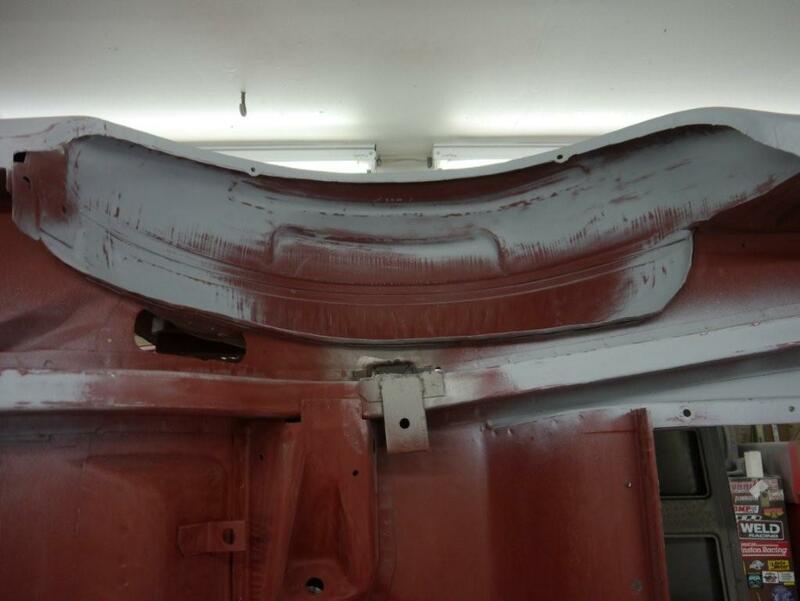 The plastic media did not etch the factory protective coating on the metal so it did not cause rust to occur during the time the body work was performed. 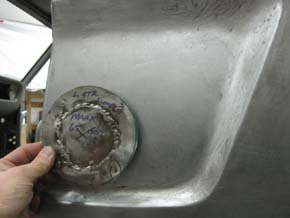 All the metal work was performed by Dave Mackey over the next seven months, no filler was used, pure metal work. 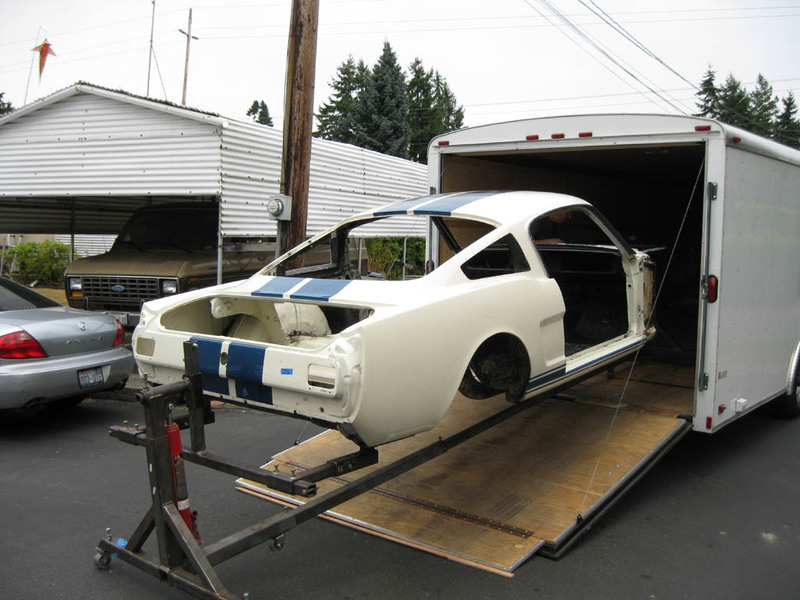 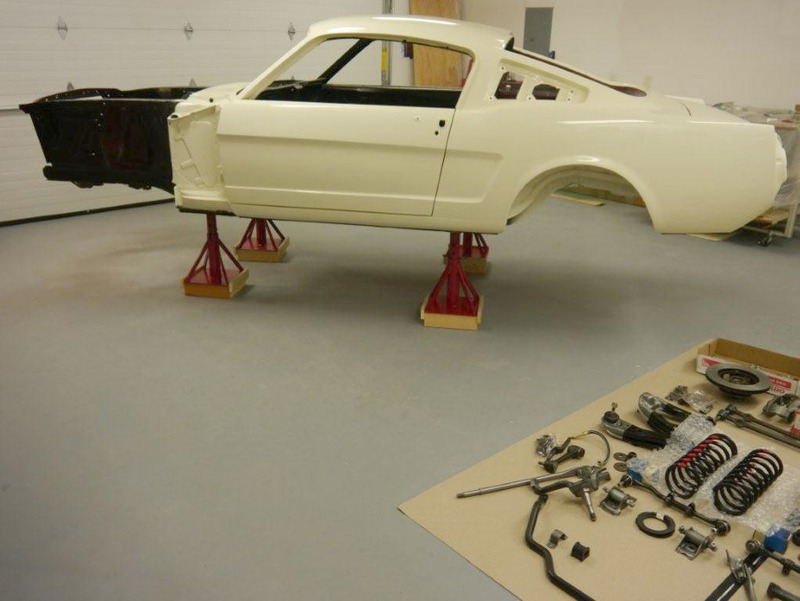 Holes in 003's rear quarter panels and wheel wells were from Bill Moir, the car's first owner, when he added 1966 GT350 brake scoops in 1966. 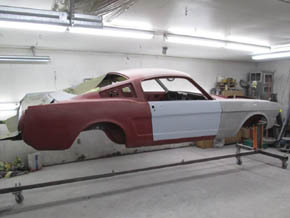 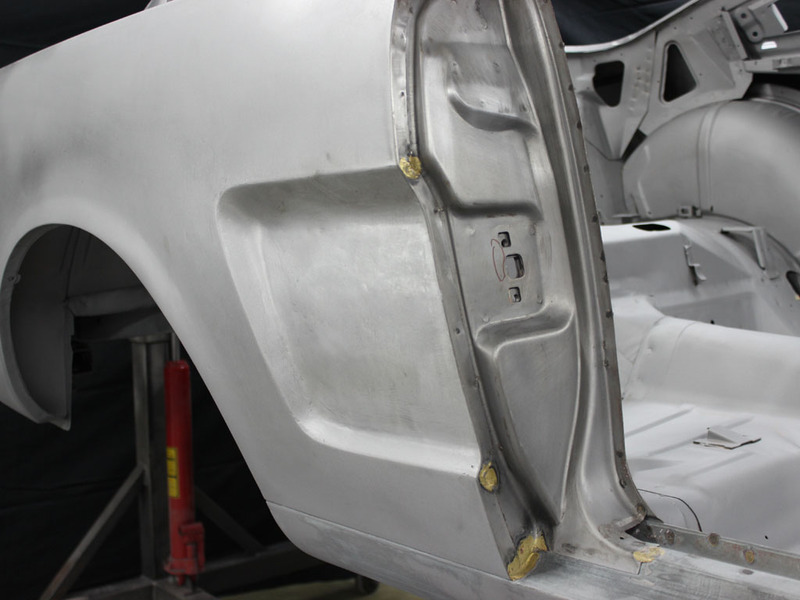 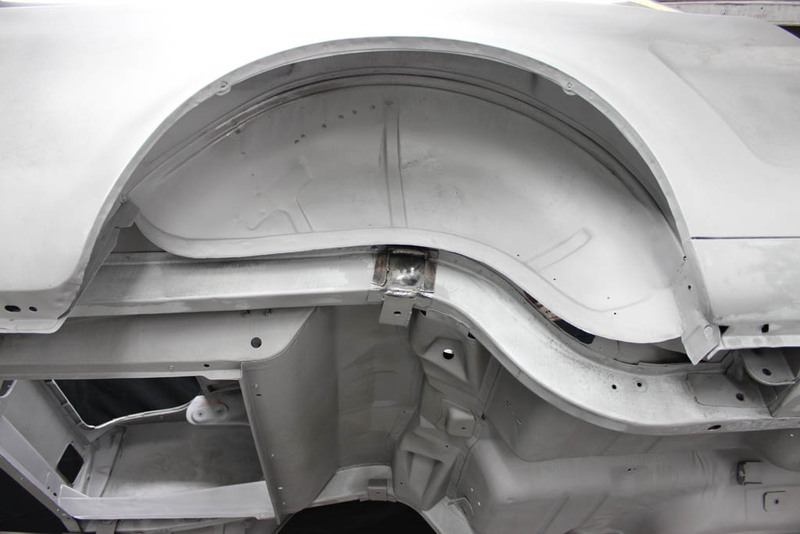 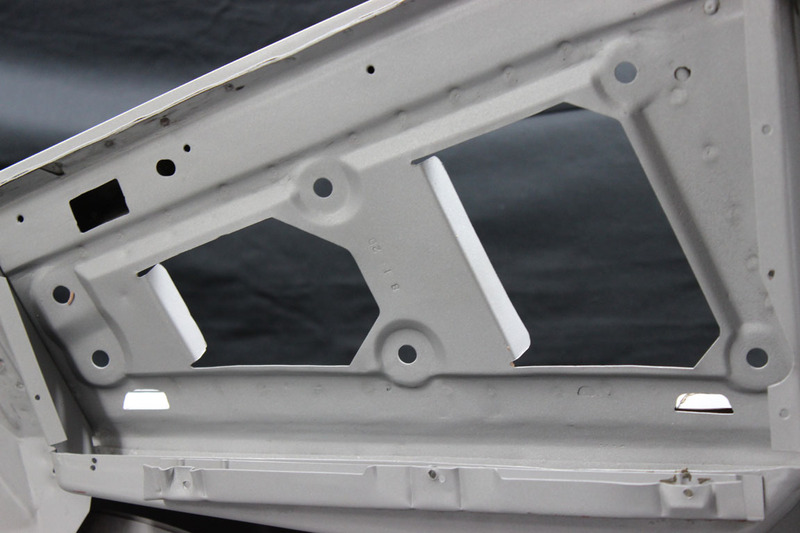 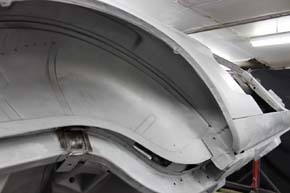 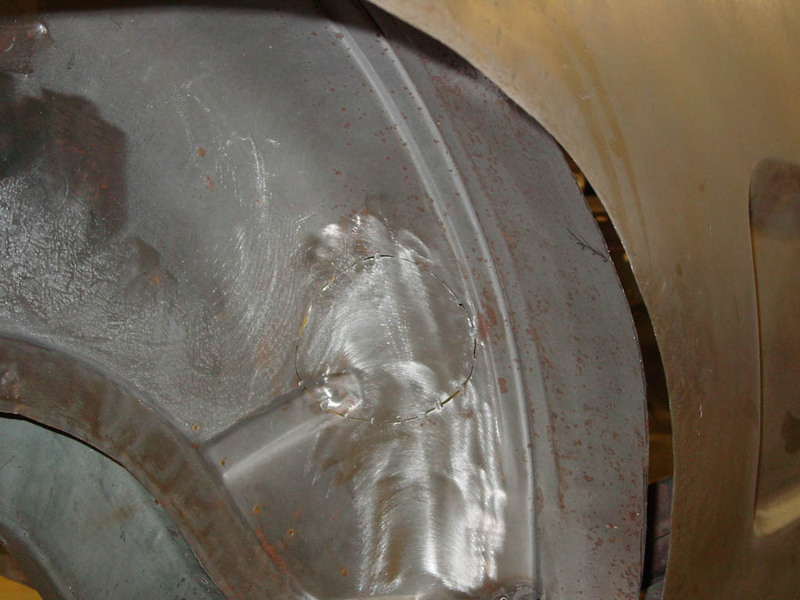 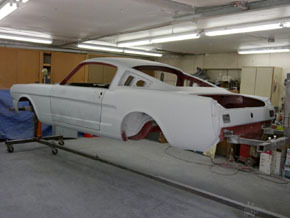 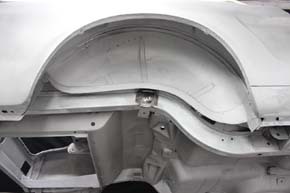 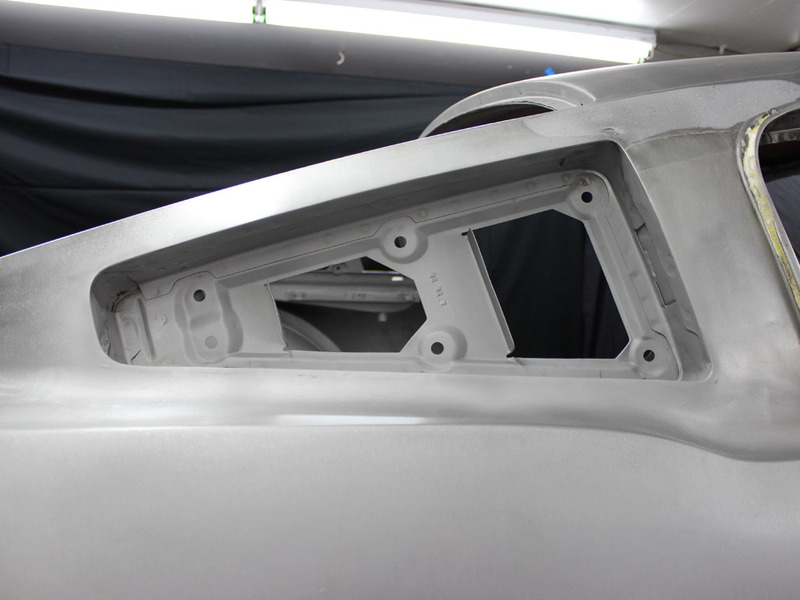 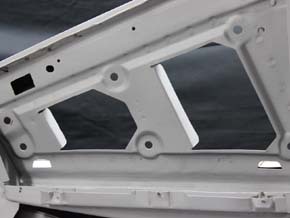 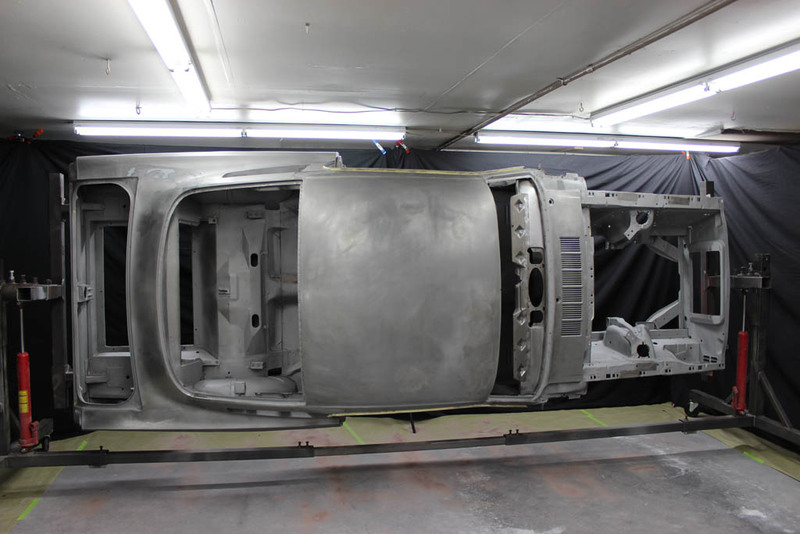 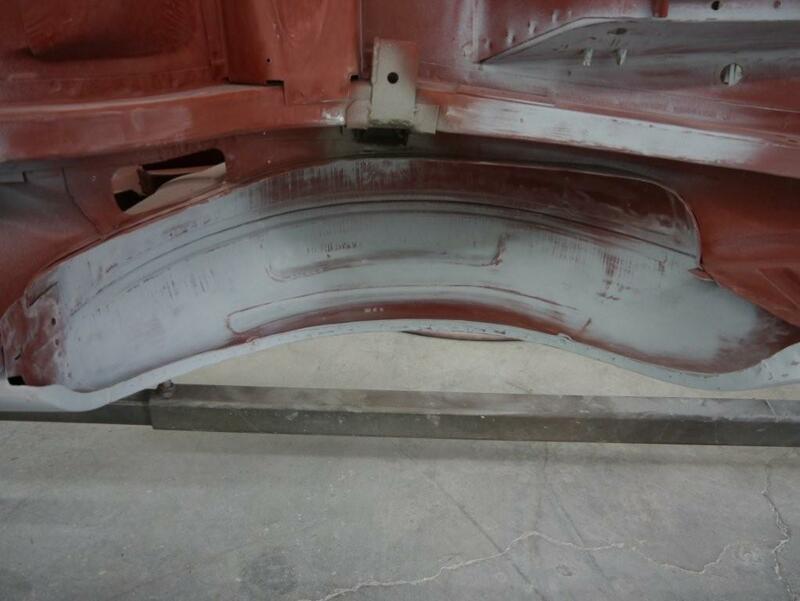 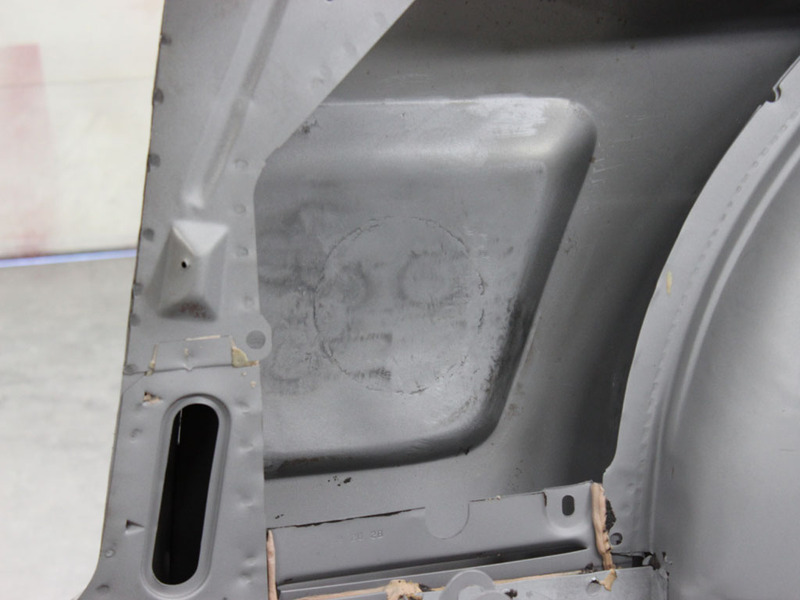 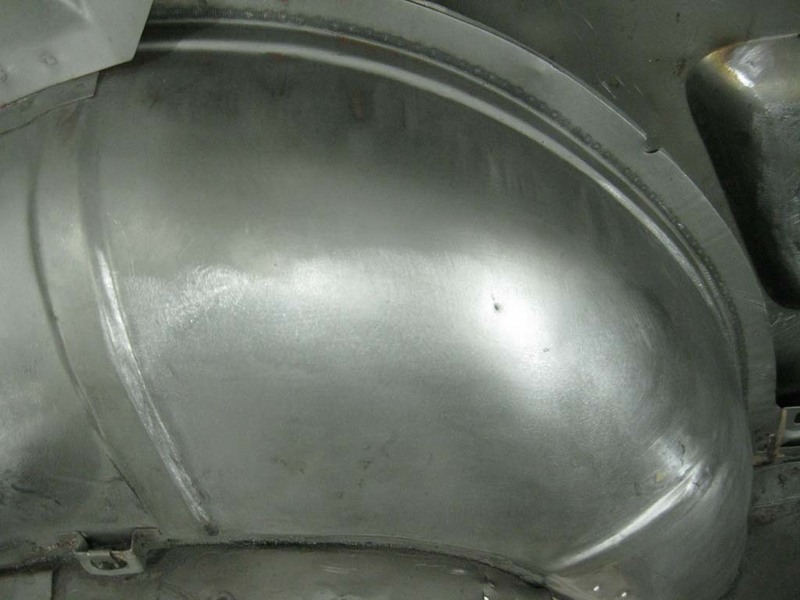 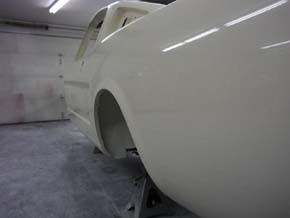 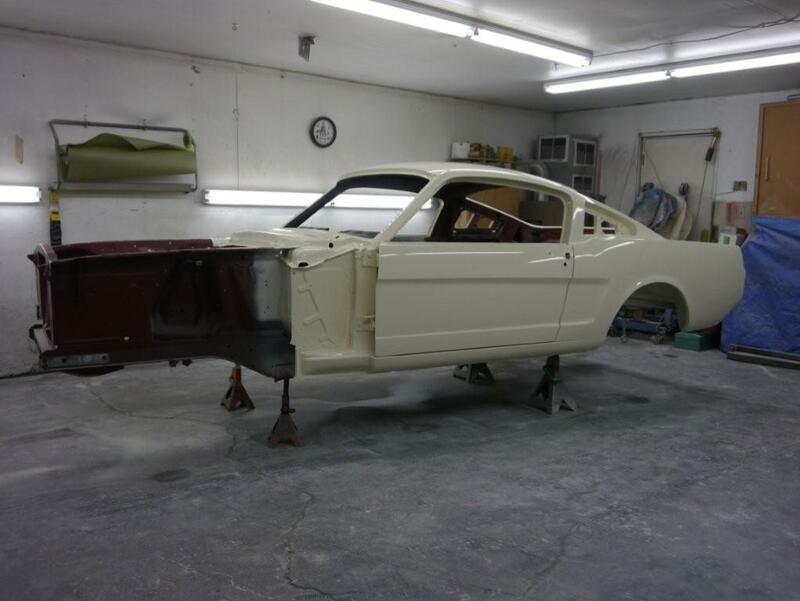 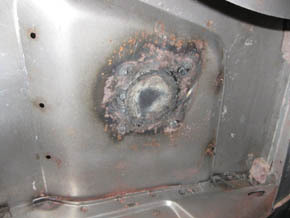 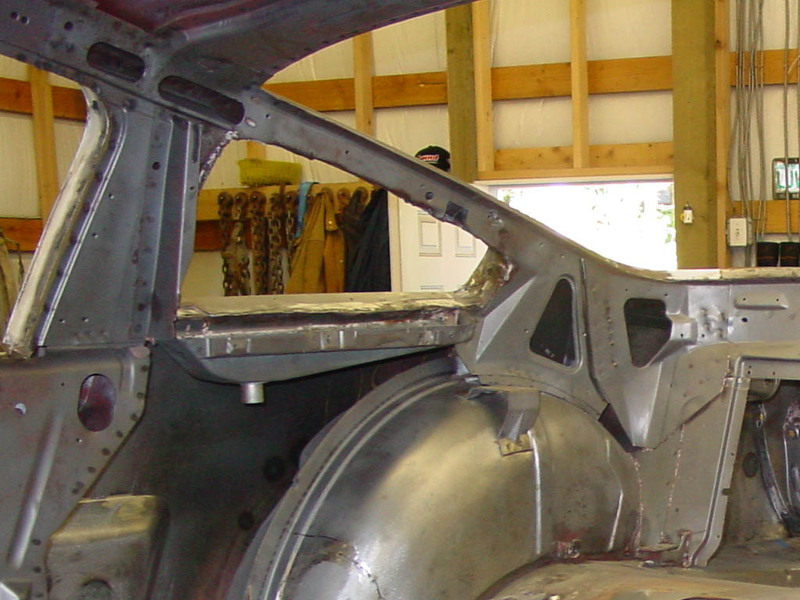 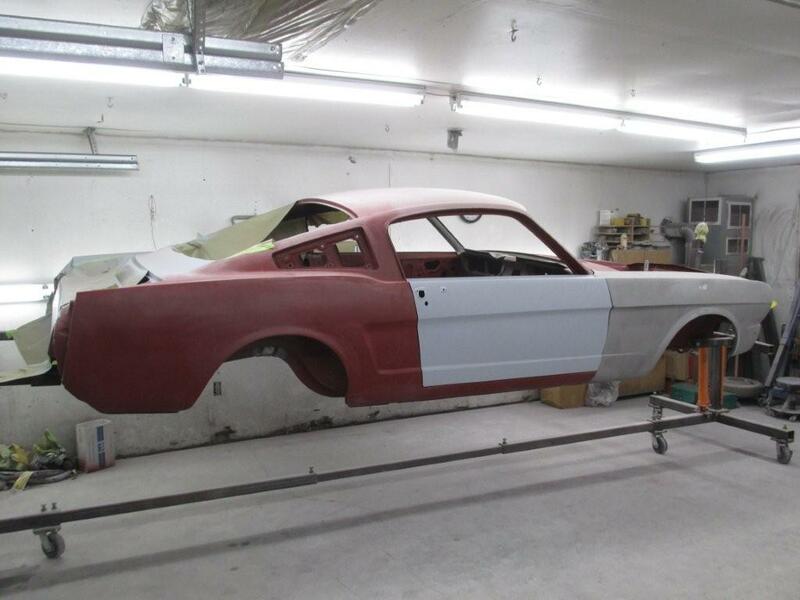 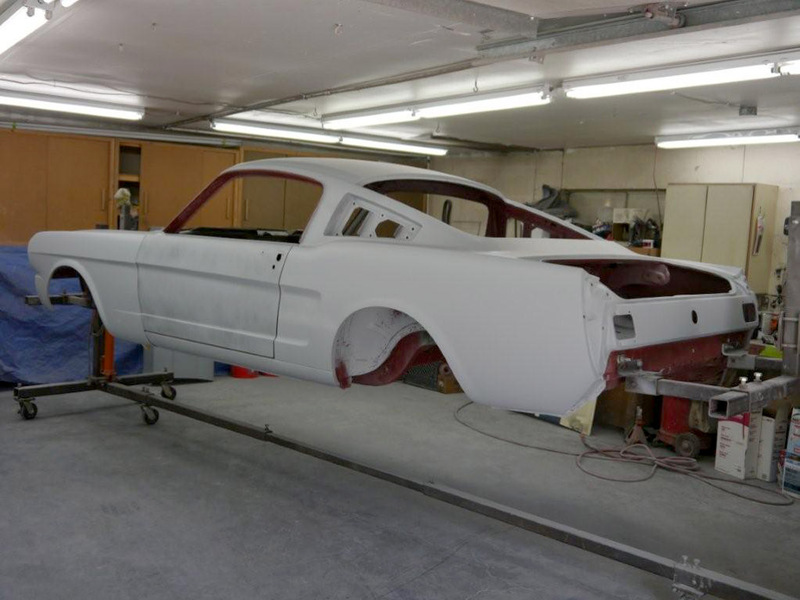 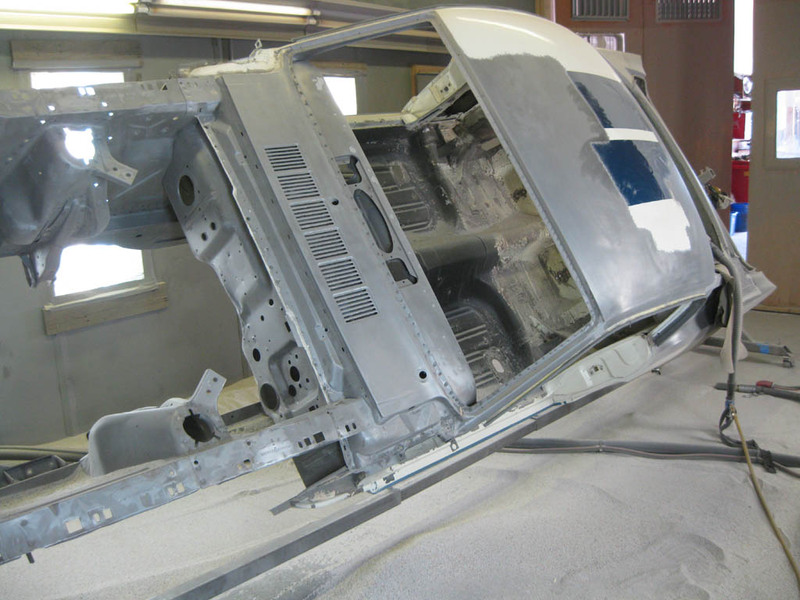 These areas were replaced with 1964-1965 original Mustang sheet metal. 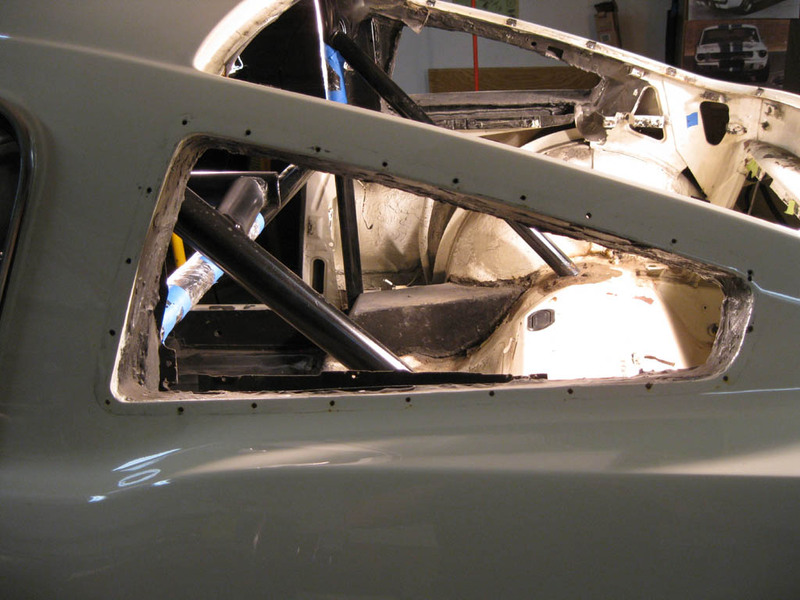 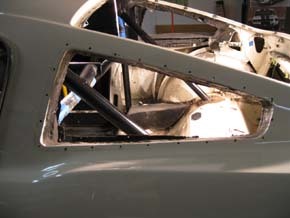 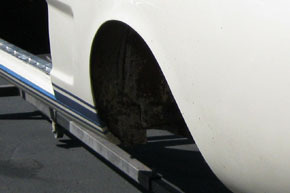 When 5S003 was set up for vintage racing, the quarter panel vents and internal braces were removed. 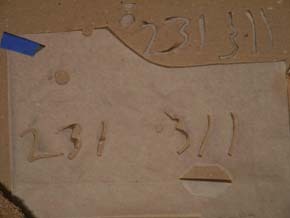 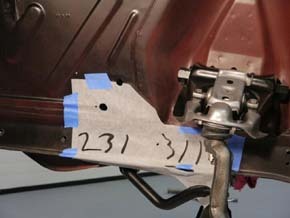 The proper date coded braces for the rear quarter air extractors were placed back into 5S003, the end result looked like they had never been removed. 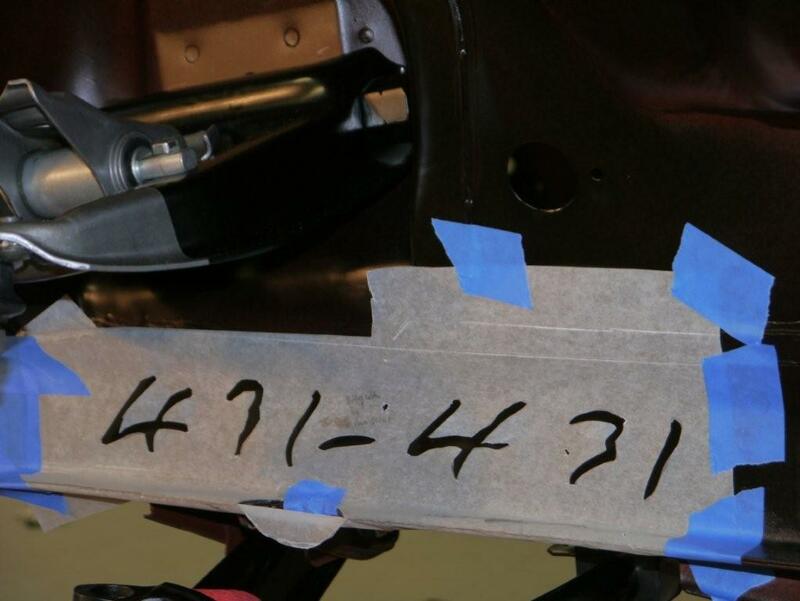 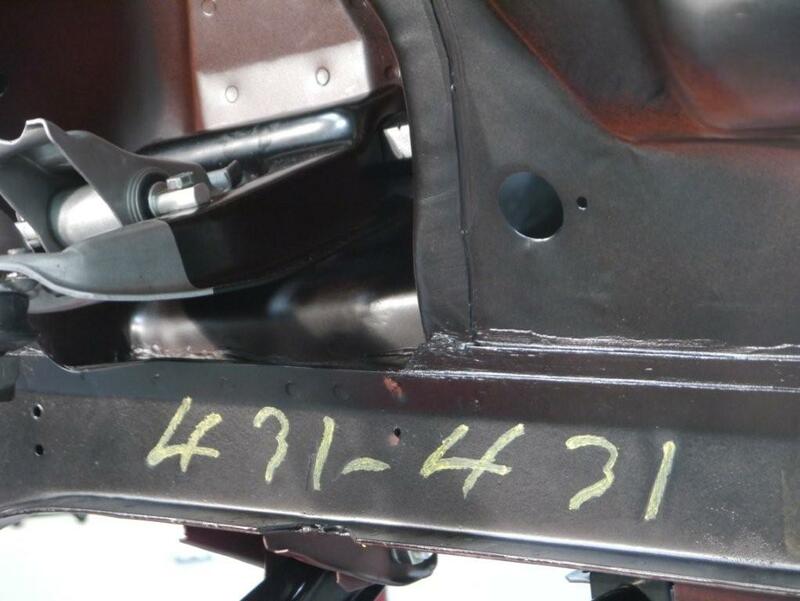 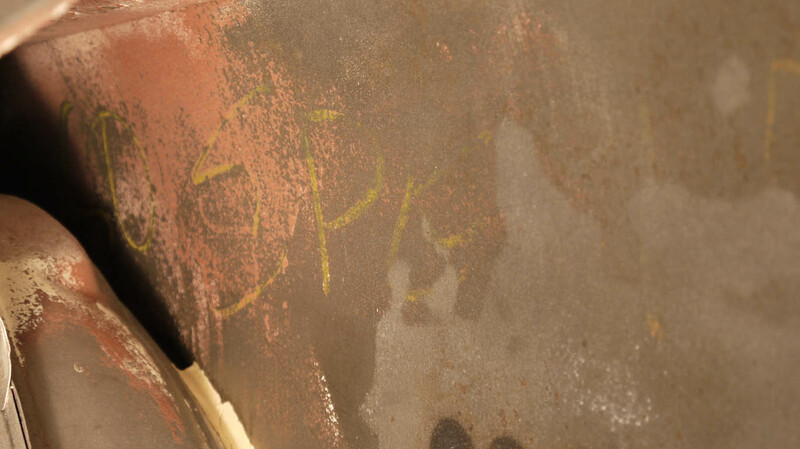 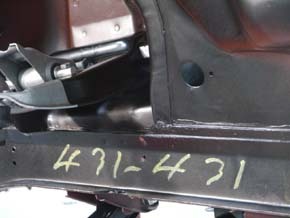 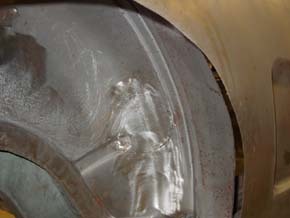 After the car was plastic media blasted, the inside of both quarter's panels read "DSO Special", this had to be written prior to the quarter panels being installed at the San Jose Factory. 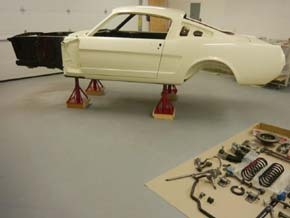 Although the meaning of "DSO Special" is open for debate, I feel it was in reference to the cars which eventually became SFM5R001, SFM5R002 and SFM5S003 were all part of a never before used D.S.O., Shelby American, an order to start the Shelby Mustang program. 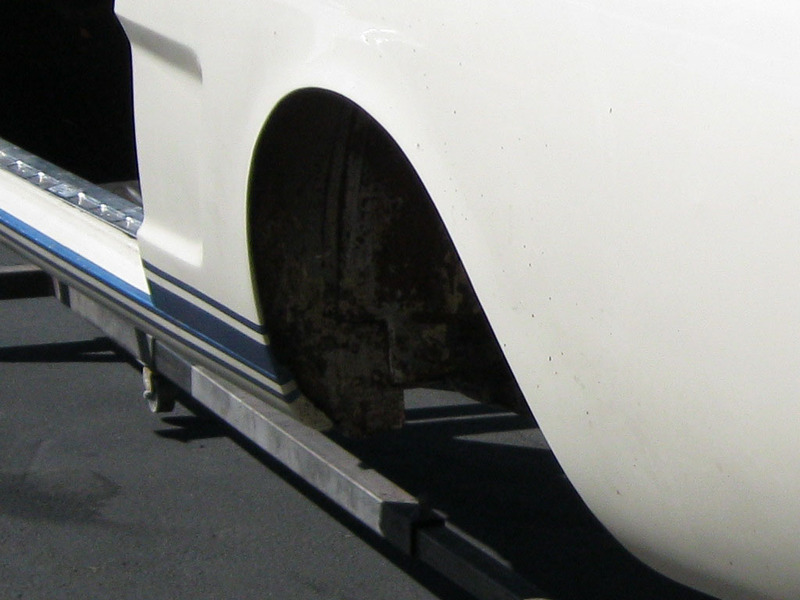 Dave Mackey's talent was most evident when he added the factory rear quarter lips / flares using original Mustang sheet metal. 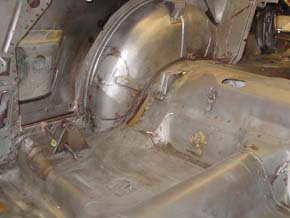 The factory spotwelds were left intact. 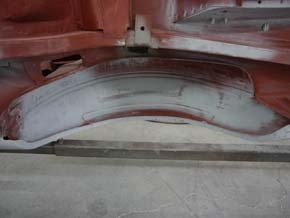 The result was that he saved the original quarter panels to the car. 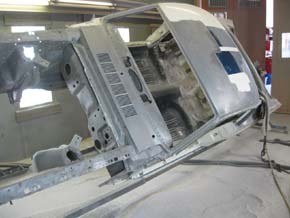 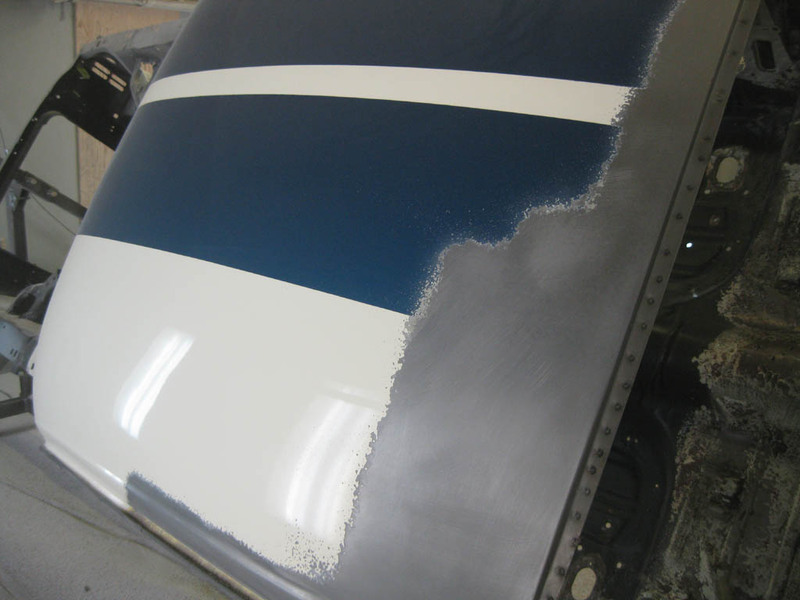 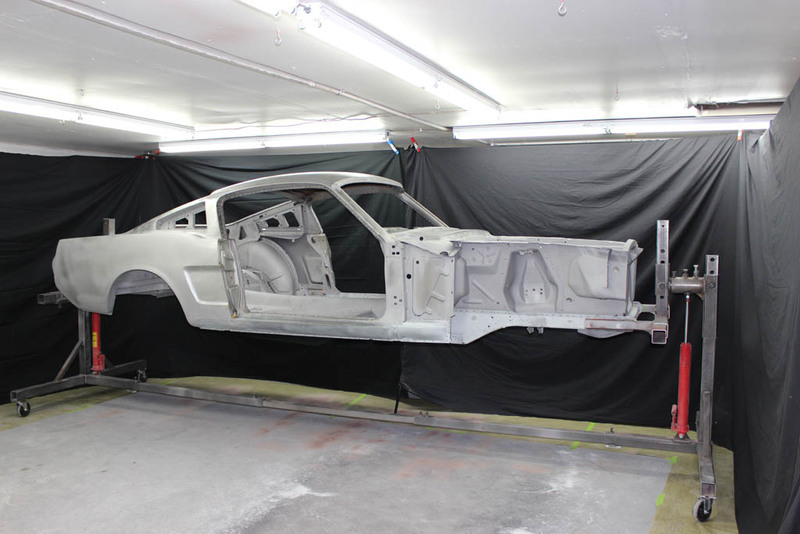 After 5S003's bodywork was completed, it was taken back to the media blaster, just to make sure the metal surface was fresh for the DP sealer and final bodywork. 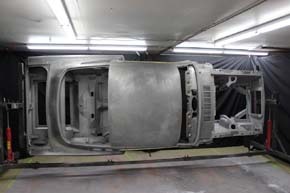 The original chassis of 5S003 was in excellent condition for all its years of vintage racing, it provided the basis for which the original doors, roof, quarter panels, and trunk lid were retained. 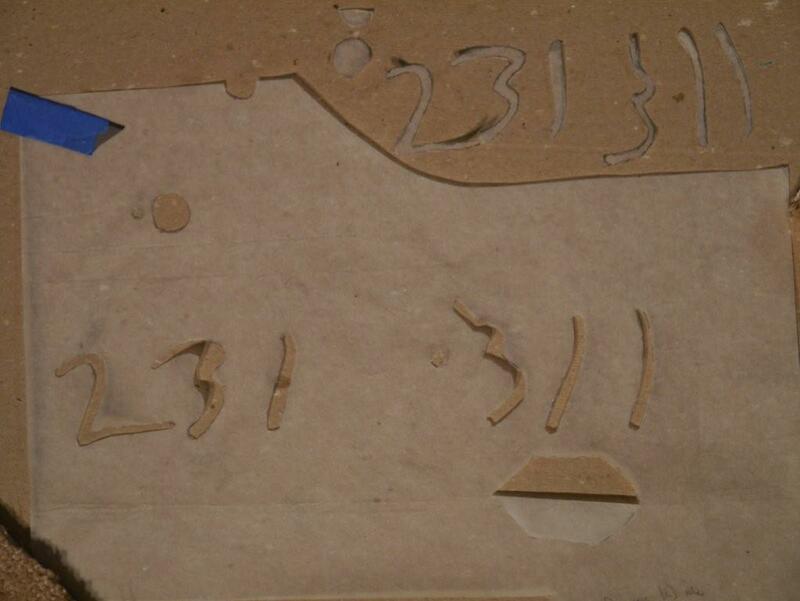 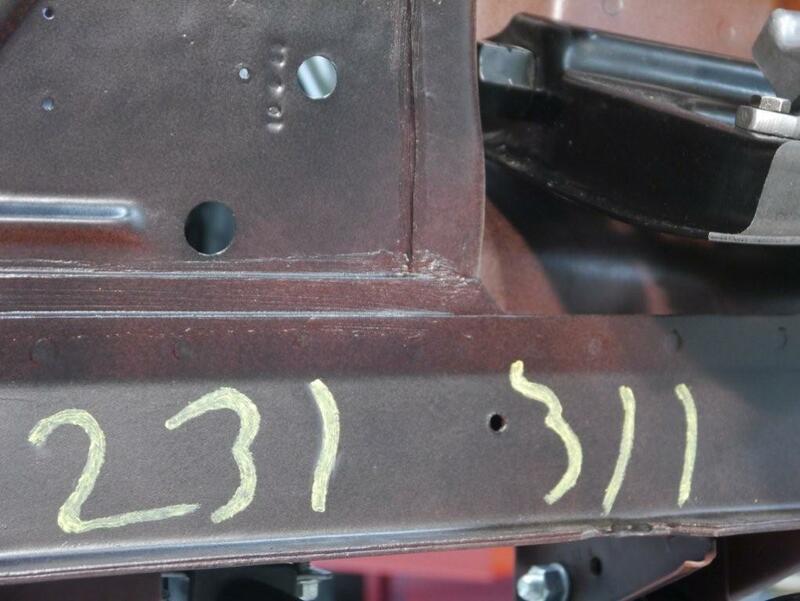 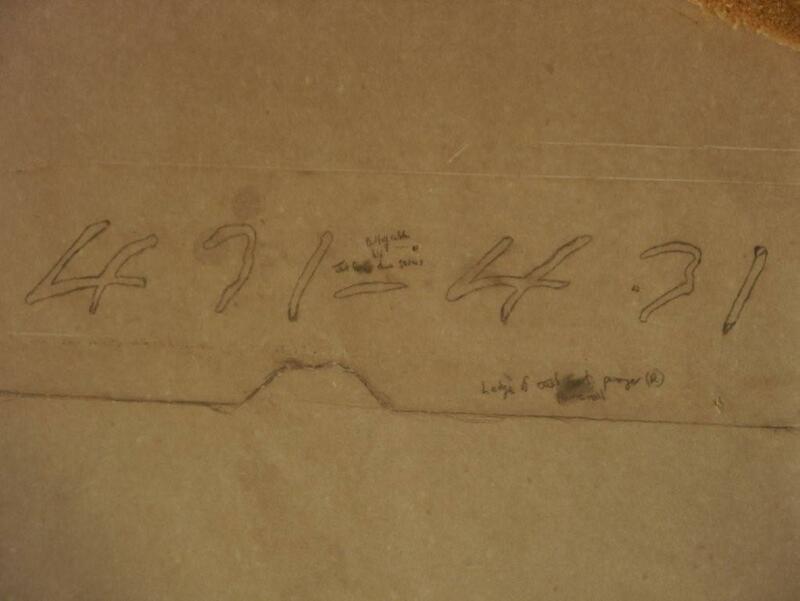 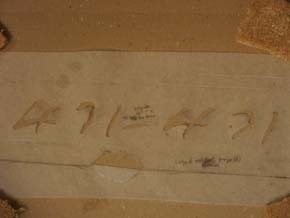 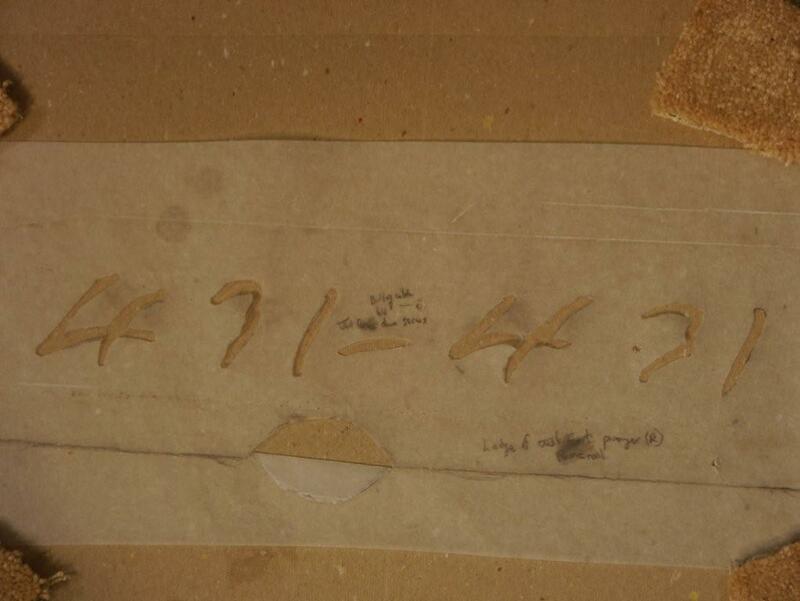 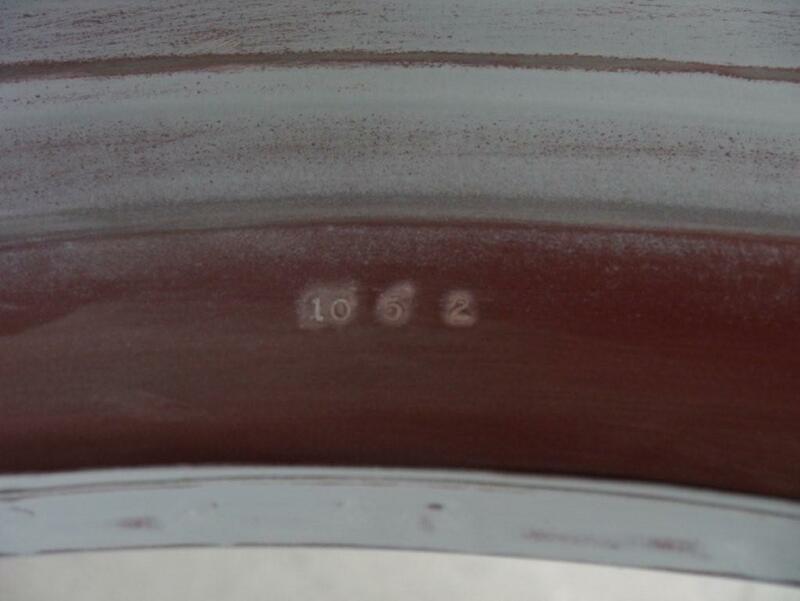 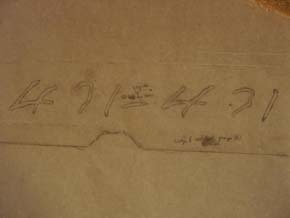 Original driver's side frame rail markings from the San Jose factory were traced, then cut into a stencil which was taped to the frame rail in the exact original location and replicated. 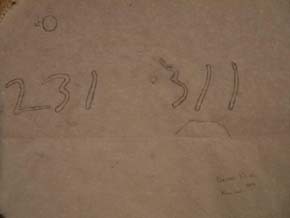 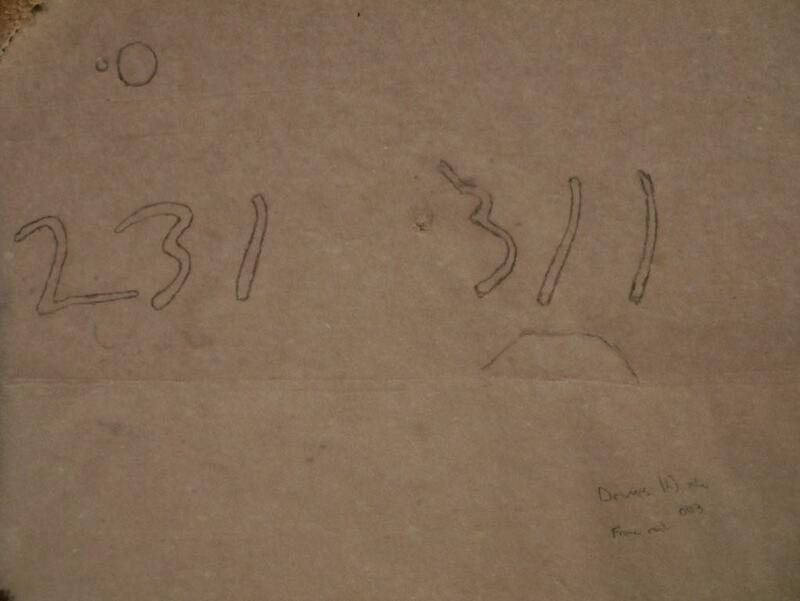 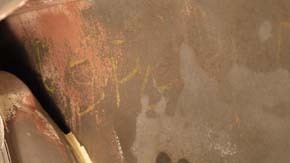 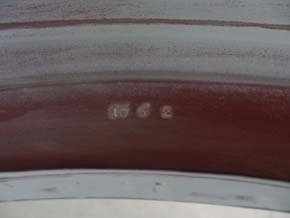 The same process was used for the original passenger side San Jose markings.